The following shows an example of how a flexagon can change as a result of the single flap flex. To perform it on a 4-sided spiral, you need to have it arranged so there are 3 leaves in one pat and a single leaf in the adjacent pat sharing the same edge (e.g. on a decaflexagon, the two pats share the same edge of the pentagon). On the 3 leaf pat, the top leaf should be separate from the bottom two leaves, hinged on the edge of the flexagon. Across the single leaf pat should be another 3 leaf pat. Tuck it under the single leaf pat. From the center of the flexagon, pull open these two adjacent pats. One side should swing open. Pull this all the way across and open the flexagon back up. An example of doing the single flap flex on a bronze 4-sided spiral dodecaflexagon. The following shows the minimal portion of a strip that will fold into a flexagon that can use the single flap flex. 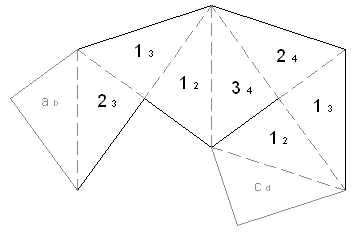 This is a portion of a right triangle decaflexagon, but a similar pattern can be used for other right triangle flexagons.